Striking teachers in Puerto Rico are battling austerity, drawing on a rich tradition of anti-colonial workers' resistance. 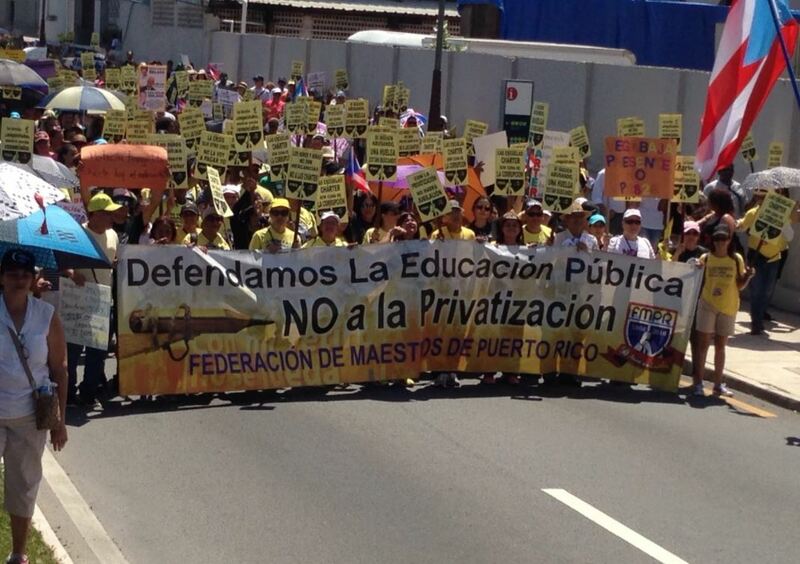 Last Monday, hundreds of Puerto Rican teachers marched past San Juan’s Capitol building to La Fortaleza, the governor’s mansion, holding signs reading “Defendemos la educación pública” (We defend public education) and “No a los charters buitres!” (No to the vulture charters!). Thousands of students and parents joined the march or held signs in front of their schools in solidarity, all across the island and as far away as East Harlem, New York. While the secretary of education downplayed the event, tweeting photos of classrooms with students and reporting misleading school opening numbers, most news outlets and social media commentators declared the strike a significant disruption. In the wake of twin disasters — one man-made in the form of a vulture fund-fueled debt crisis, and one natural in the form of last September’s Hurricane María — Puerto Rican leaders are attempting to implement a vast austerity program, claiming it will solve the island’s economic woes. In the eyes of many Puerto Ricans, however, this is textbook “disaster capitalism”: capitalizing on a moment of crisis, when the population is weak and unable to mobilize, to ram through pro-market austerity measures. Although the government has slowly been rolling out austerity measures since the debt crisis began, post-hurricane, it’s doubled down. And the island’s public school system is one of the leading targets. In January, Governor Ricardo Roselló Nevares announced a fiscal plan that called for sweeping neoliberal reforms, among them more public-private partnerships and the privatization of the island’s electric grid. Soon after, he announced an education reform package that spelled out what this larger agenda meant for schools. Secretary of Education Julia Keleher claimed that New Orleans — which witnessed a mass influx of charter schools post-Hurricane Katrina, leaving only five public schools in operation — served as a “reference point.” She and Roselló also drew on language favored by ed-choice advocates on the mainland, arguing that the reform would provide “options” and “efficiency,” and accepted advice from EdChoice, the Indiana-based (and Milton Friedman–descended) school-choice advocacy group. Governor Roselló was also reported visiting charter chains in mainland cities such as Philadelphia and New York. Keleher, a non–Puerto Rican from Pennsylvania who is currently running the school system, has even garnered her own hashtag, #KeleherGoHome, in clear homage to the old classic “Yankee Go Home.” Her non-native roots and not-quite-fluent Spanish evoke the long history of the United States appointing non-Puerto Rican “experts” to run the island and its education system. To Puerto Ricans, Keleher’s role highlights the island’s precarious colonial status and harkens to even less sovereign days. Massive school closures began well before the hurricane hit, part of the austerity agenda pushed by previous administrations and the unelected, mostly mainland-composed fiscal control board (“La Junta”). They picked up more steam after a hedge fund–commissioned, IMF-backed report called for more closures and school-choice policies in 2017. And now, in the post-hurricane landscape teachers are fighting what they call the “Whitefish” of education reform — a reference to the controversial energy contract awarded after Maria — and “vulture charters,” likening their tactics to the vulture funds that profited off Puerto Rico’s debt crisis. Martínez and the FMPR are part of a broad spectrum of anti-neoliberal agitation. Two massive university student strikes occurred in 2010 and 2017, the first after then-governor Luis Fortuño announced significant cuts and tuition hikes at the University of Puerto Rico (UPR), and the second after La Junta announced public-sector furloughs and further budget cuts to the university. Some of the students in the first university strike are now teachers themselves, or parents of children in the public schools. The student strikes garnered support from labor and social-justice movements, leading to a massive general strike — possibly the largest in the island’s history — last May 1. In addition to this coalition work, the teachers are building on their own traditions. Vocal union and community organizing halted pro-voucher proposals in the 1990s. A 2008 teacher strike led by the FMPR managed to temporarily prevent the implementation of charters. And teachers and their unions were some of the first-line responders after the hurricane hit, forming work brigades that cleaned debris from schools and turned them into community centers — an experience that solidified grassroots networks and warmed many families to the teachers’ cause. This in addition to a century-long tradition of negotiating with US imperial agents, advocating for greater respect for Spanish-language and Puerto Rican culture in the island’s schools, and a greater say in educational decisions by Puerto Ricans themselves. Despite this impressive record of resistance, the island’s political leaders and investors are hoping the post-hurricane confusion and demobilization will allow them to push their agenda through. Many are still without power on the island, and a mass migration of residents to the mainland has unsettled communities. Over thirteen thousand students and their families left the island after the storm, taking up residence in Florida, New York, and other states. They’re uncertain of their return, and less likely to come back if their schools are closed. While some groups, including the larger Asociación de Maestros Puertorriqueños (AMPR), have chosen to negotiate with Keleher and the Senate, their efforts at compromise have largely failed. Despite a few amendments to PS 825 in favor of teachers’ salary and benefit protections, the Senate approved the law on Tuesday with the most significant structural components intact, including charters and vouchers. The FMPR rightly contends that only uncompromising and mobilized grassroots efforts, and possibly another teachers strike, can prevent disaster capitalism from triumphing. Who Will Seize the Schools? As US citizens, Puerto Ricans on the island and in the diaspora have long played an important role in the US left. And their organizing efforts continue to provide valuable lessons. With a foot in both the United States and Latin America, Puerto Ricans have exemplified the power of cross-border solidarity. For decades they have not only connected mainland (especially urban) politics with island-based organizing, but also linked struggles across Latin America and the United States. Latin American organizing traditions, from Chile to Mexico to Brazil, have significant experience mobilizing against neoliberal austerity, particularly in the realm of education. As such they provide valuable insights into how to build a broad multiracial and multiethnic mainland coalition. And Puerto Ricans, both on the island and in the diaspora, are well positioned to link these hemispheric struggles. Puerto Rican left organizing has long embraced not only an antiracist, but an anti-imperial and anticapitalist agenda. As a colony of non-white citizens who have been a laboratory for the mainland’s economic agenda, the Puerto Rican left maintains a rich history of anticapitalist, pro-sovereignty working-class resistance. Puerto Rican history also reveals the limits of “third way,” centrist compromise. The Commonwealth status grew from this approach following World War II, when Governor Luís Muñoz Marín and his Popular Democratic Party chose to align with American empire and capital in exchange for slightly more sovereignty. The result was a decade or so of economic growth followed by four decades of economic and political precarity, a legacy which came to a head with the debt crisis. As the FMPR argues, only a firm stance against the forces of capital and empire will defeat the neoliberal agenda. And finally, ever since the American takeover of 1898 forced the English language and an Americanizing curriculum on its subjects, education in Puerto Rico has been a vehicle for the imposition of the colonial, capitalist project on the island. As such, schools on the island and in the diaspora have become a central site to contest that project. The mainland US left would do well to listen to teachers and students, and let their voices lead, as they come into direct contact with the brutal effects of austerity on a daily basis in their classrooms. As the Puerto Rican nationalist organization the Young Lords often said in the 1960s and 1970s, in the context of campaigns for community control of schools and the implementation of black and Puerto Rican studies curricula: “Seize the schools, que viva Puerto Rico libre!” The refrain still rings true today. Lauren Lefty is a doctoral candidate at New York University studying the history of education in the United States and Latin America. Her dissertation is a transnational history of education politics and activism in New York and Puerto Rico during the Cold War.